This is three new Futishiki puzzles of size 8X8 for your own enjoyment. The rules are simples, in each cell put the number from 1 to 8 in such way that at the end each row and column has all the numbers only once. Futhermore you should respect the signs greater than > and less than <. This is three new Futishiki puzzles of size 7X7. The rules are simples, in each cell put the number from 1 to 7 in such way that at the end each row and column has all the numbers only once. Futhermore you should respect the signs greater than > and less than <. This is a serie of 4 Futoshikis of size 5X5, they are quick to do but just enough challenging to enjoy yourself. 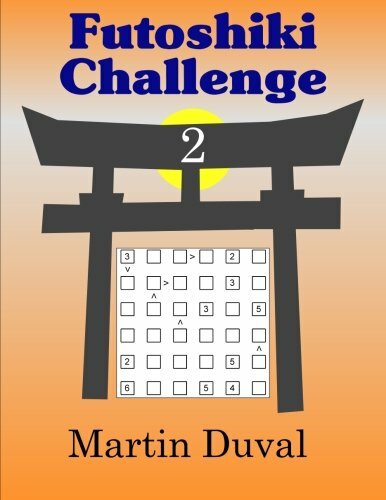 My two books Futoshiki Challenge 1 and Futoshiki Challenge 2 cost now $6.95 instead of $9.95. Hurry up this reduction is for a limited time. They will please every puzzle enthusiast. 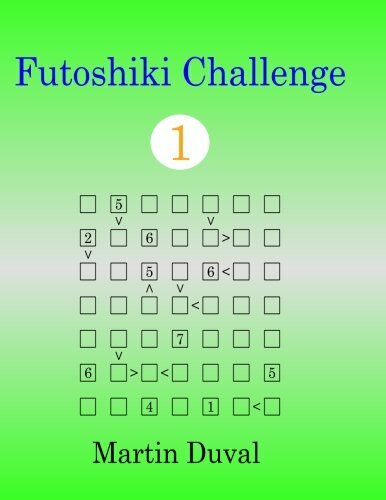 And now 4 Futoshiki puzzles just for you, 3 easy except the last one which is not so easy.